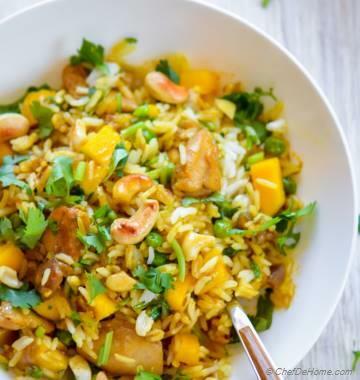 A sweet, sour and pleasantly spiced Curry Chicken Salad. 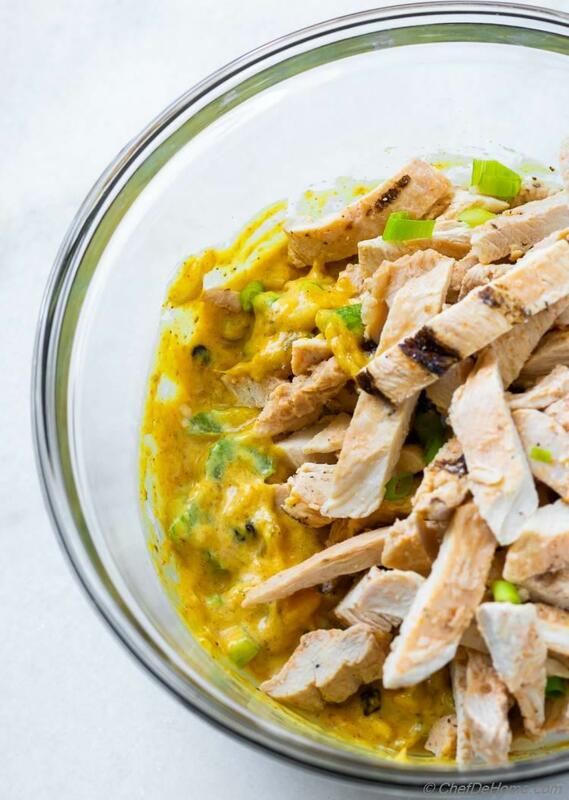 Creamy Curry Chicken Salad with grilled chicken breast, sweet mango chutney, crunchy almonds, and aromatic flavor of spicy curry powder. 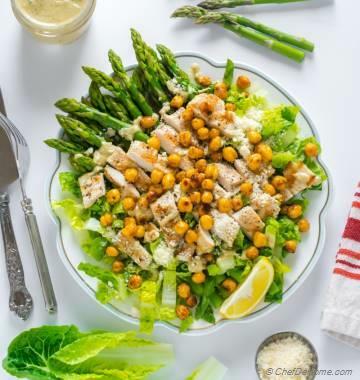 Also known as coronation chicken salad, it is an easy chicken salad with amazingly bold and creamy curry flavor. One of our most-requested salad for potlucks and family gatherings, it is also Gluten free, Dairy Free. 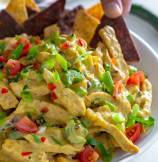 Curry Chicken Salad is perfect way to satisfy curry-cravings-in-hurry. 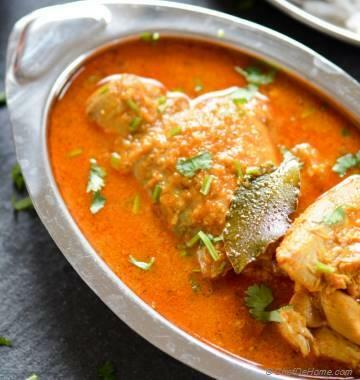 Where traditional curries take time to cook, develop flavor... Salad gets instant boost from cooked mango chutney, chicken, curry powder and some easy-to-find pantry staples. Resulting Salad is refreshing, spiced, creamy, sweet and sour. It can be served cold, works great in sandwiches, lettuce wraps. I even love stuffing it in avocado for a delicious appetizer. 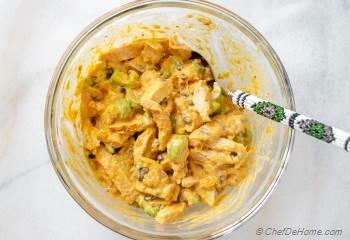 Curry Chicken Salad is also know as Coronation Chicken Salad. It gained huge popularity in European countries after World War II. In most American Delis, this salad is loved-shortcut-to-curry-chicken-salad. My first intro to this Salad? First time in Vegas restaurant (Aria) as Curry Chicken Salad Sandwich. I loved the balance of favors even though it lacked the true curry flavor. Second time, I tried it in Whole Foods. We eat so much curry at home, I don't easily reach for a curry salad in eateries. But Whole Food's curry salad had rave reviews. Many people told me they love it in wraps or on lettuce wraps. So, I decided to try. Unfortunately, I'm never so disappointed. It was cling sweet salad polluted with almonds. No tang only sweet on top of sweet. Right that moment I decided to give you recipe for a REAL Curry Chicken Salad. A good curry salad should be vibrant with right balance of spicy, sweet, crunchy... still highlighting the main ingredients i.e. chicken, curry, and mango. This is what I have for you today. 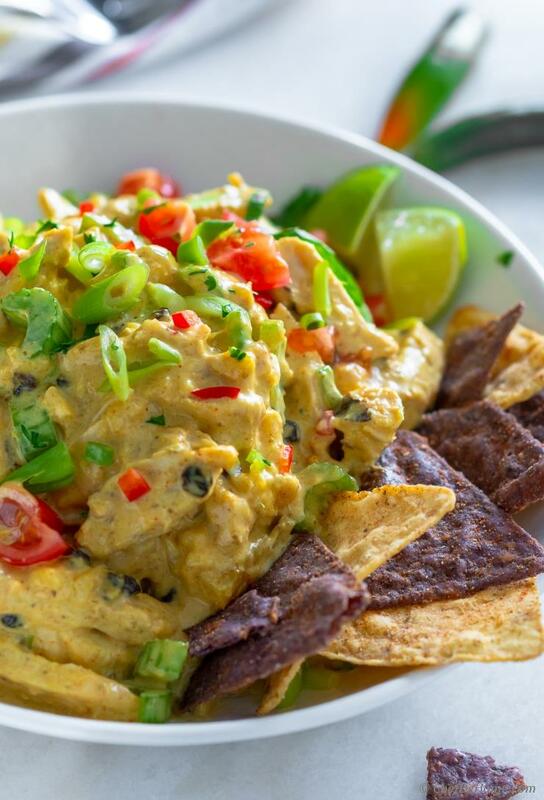 Chicken Curry Salad recipe with refreshing curry flavor, sweet and spicy, with distinct flavor of mango chutney, hint of black currants and almonds. Honestly, I specially never cook for this salad. 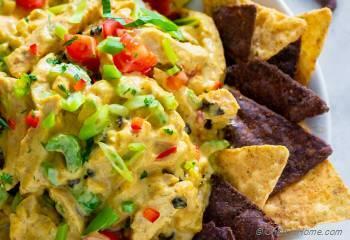 Curry Chicken Salad is a cold chicken salad which works perfect with pre-cooked cooled chicken. So, on weekend, when Vishal grill chicken for him.. 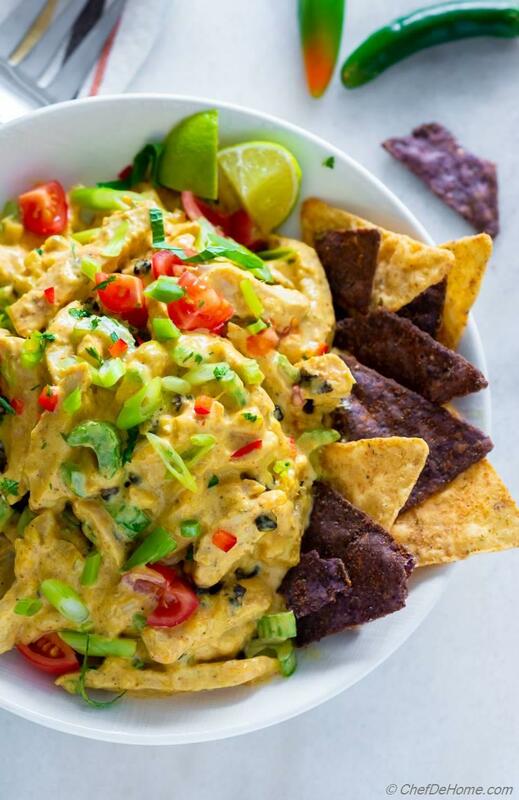 I hand-over a pound extra to make Curry Chicken Salad on weekdays or whenever we planning salad-for-dinner, hearty lunch sandwich, or headed for a potluck. That said, use pre-cooked store bought chicken strips. (like I did for pictures) Or cook at home. There is no requirement to a special flavor for chicken. To cook fresh chicken at home, make sure to season chicken with salt and black pepper. Then, either grill or pan sear chicken until chicken's internal temperature in thickest part registers 165 degrees Fahrenheit. 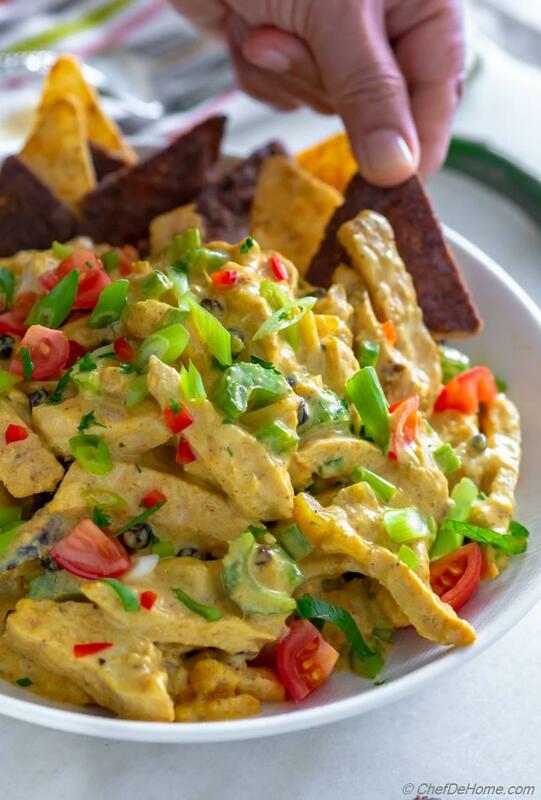 Along with chicken, the heart and soul of good Curry Chicken Salad is Curry Dressing/Sauce. I highly recommend using good quality curry powder, mayo (creamy base), and mango chutney. These three ingredients define this salad. Recipe is so simple that good quality ingredients are quintessential. 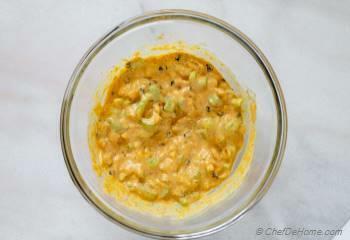 Mango Chutney: When I planned to share Curry Chicken salad on blog. 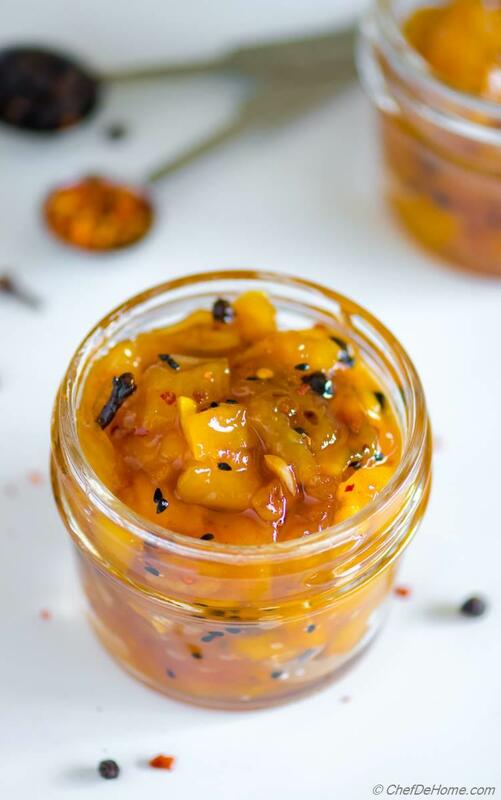 I first invested time in making a good and delicious mango chutney. I highly recommend using my Homemade Mango Chutney recipe for this salad. This Homemade mango chutney is made with sweet seasonal mangoes and keeps good in refrigerator for up-to 3 weeks. Curry Powder: I remember my promise to share homemade curry powder (hopefully soon). For now, use this curry powder or your favorite brand. Please note that yellow-orange color salad depends on curry powder and mango chutney. If color is not that bright yellow-orange, use pinch or two of turmeric powder. 2) Serving curry salad the same day. Curry Chicken Salad (without yogurt) stays good for 2 days. Also, the curry flavor improves as salad sits in refrigerator. But when yogurt is used, it can start loosing little water and thin-out the salad dressing. So, only use yogurt when serving salad the same day. Note: Yogurt adds good tang to the base sauce but it is not a required ingredient. I only recommend using Greek yogurt (thick without water content). So make some chutney at home, try on toast, on grilled chicken and save some to make this delicious Curry Chicken Salad. I hope you will enjoy this salad as much as we do. Happy cooking! 1. In wide bowl, add lime juice, olive oil, curry powder, mustard, 1/4 tsp of salt and 1/4 tsp of black pepper. Mix well. Top with *mayo (*and yogurt, if using) and chopped green onion (mostly yellow part). Mix well again. 2. 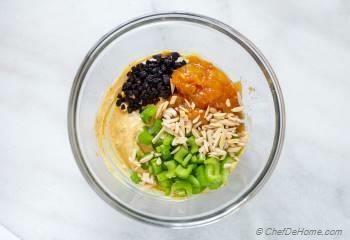 Add currants (or raisins), diced celery, mango chutney, toasted almonds. 3. 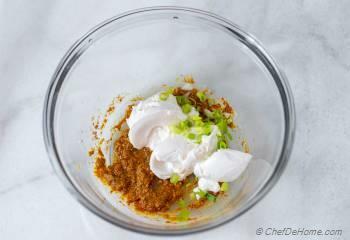 Mix to combine into a creamy curry sauce. Taste and adjust salt and lime juice. Next, add cooked and diced chicken. 4. Mix chicken with sauce. Refrigerate until ready to use. 5. When ready to serve, scoop into platter. Garnish with green onion. (optional toppings: red onion, diced cherry tomatoes, chopped cilantro). Serve on avocado, toast or with side of chips. Enjoy! Salad tastes better when served cold, after 6-8 hours refrigeration. It keeps good up-to about two days. *Mayo: 1) You can replace half of mayo with Greek yogurt for more tangy flavor. I recommend serving salad the same day when yogurt is used. 2) I also often replace mayo completely with vegan mayo. Even though it is a chicken salad, vegan mayo is eggs free which is good when serving guests with egg allergies.